The College of Business Administration at the International University of Business Agriculture and Technology (IUBAT) held a massive fun-filled event for the students and the faculty members of the BBA and MBA programs recently. The event was titled as “CBA Get Together – 2018”. The program took place from 10:00 AM in the morning to 05:00 PM in the afternoon. This eventful day-long program was conducted in two phases. The first phase of the included the inauguration of the program with a formal opening, followed by games and sports competitions for the students and led to the second phase which included a prize awarding ceremony and a cultural gala. The get together event of CBA began at 10AM sharp with recitations from the Holy Quran, demonstration of respect towards the departed soul of the Late Prof. Md. 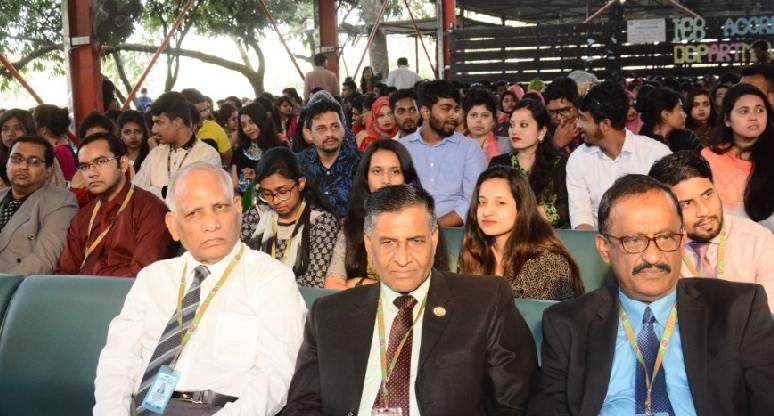 Alimullah Miyan, former Vice-Chancellor of IUBAT, chorus singing of the National Anthem of Bangladesh and an opening speech by Professor Dr. Hamida Akhtar Begum, the honorable Pro-Vice Chancellor of IUBAT. After inauguration, the program continued through a number of entertaining games competitions. A total of five games took place in this stage of the get together event, for which prizes were awarded. The games that took place were: “Hari vanga” (break the pot), “Spoon-marble race”, “Save the balloon”, “Biscuits dump race” and “Find the coin”. The prizes were awarded to the 1st and 2nd place winning participants (both male and female) in each game. This session of the program ended at 1PM and all the participants went for prayer and lunch break. Around 2:00 PM, the second phase of the day-long event began. All the participants gathered in the open auditorium of IUBAT for the prize awarding ceremony. The prize awarding ceremony began with awarding of prizes for the games competitions and included a raffle draw section. A total of 39 prizes were given, among which 16 prizes were awarded for the games 23 prizes were awarded in the raffle draw. After concluding of the raffle draw session, a cultural gala took place in the open auditorium. The eventful gala consisted mainly of songs and dance performances by students, alumni and faculty members of CBA. The response from all the participants of this event was quite positive. The program concluded successfully at 5:15 PM in the afternoon.